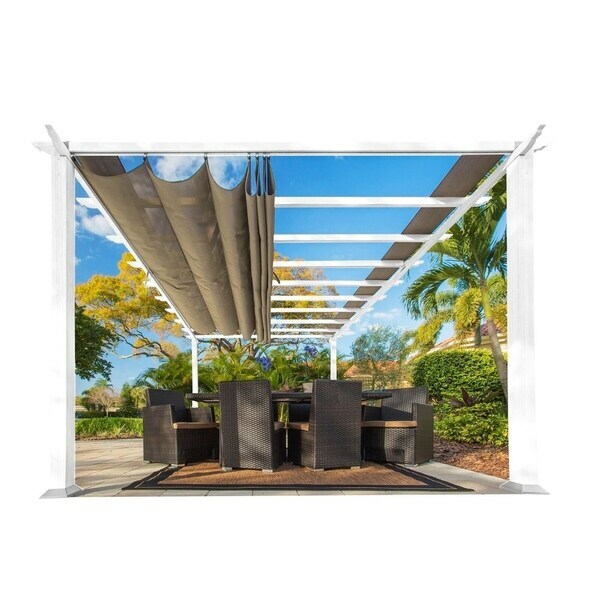 Aluminum Frame Pergola with a Convertible top that can be manually opened and closed to allow just the right amount of sunshine to come in. Perfect for star gazing in the evening too! The frame is powder coated an elegant white. This pergola is maintenance free! Ground stakes are included and bolts that can be used to secrue this Pergola to a wooden deck or concrete slab are provided. Installation is problem free. This Pergola comes with clear instructions that have step by step diagrams. Dimensions 192.0 In. X 132.0 In. X 94.81 In. "Is the retractable top on the pergola waterproof, meaning will it keep rain off the furniture when is opened?"